Yesterday, we lost another phenomenal musical legend – Whitney Houston. It is a tragic, sad and unsettling end to a career that was filled with enormous success and accolades. In the video below, you will hear a remarkable performance on the The Tonight Show with Jay Leno featuring Ms. Houston’s powerful rendition of the Christmas classic, “Do You Hear What I Hear”. She turned this very average song into a vocal masterpiece. Indeed, there were both good and bad voices; the former inspiring her to give memorably significant and unique performances and the latter pushing her toward a life filled with insecurity, chaos and severe drug addiction – all rooted in her struggle with mental illness. For, at the root, she was suffering from a mental abnormality, thus allowing her life to spiral out of control. Thousands upon thousands of patients are cured every year, but many slip through the cracks. And Ms. Houston, unfortunately, fell into the latter category. And even though the messages behind most of her songs gave us hope and courage to persevere in our personal lives, to embrace life with love and compassion, the messenger failed to heed her own advice. For although Whitney Houston had the voice of an angel, she was relentlessly chased by demons. What a heartbreaking anomaly. Tonight on the Grammy Awards Show, Jennifer Hudson will pay tribute to the late and great Whitney Houston. I am sure it will be an emotionally-charged tribute and one that will not be easy for Ms. Hudson. However, I can think of no one better, with the exception of Beyonce, to deliver such a gigantic performance. Indeed, Jennifer Hudson has weathered personal tragedies and has since triumphed in the face of adversity. So, she is really the perfect choice to remind us about the extraordinary legacy of music we have inherited because of Whitney Houston’s musical influence. In the meantime, have a listen to this beautiful performance video below. It showcases Whitney Houston’s extraordinary vocal talent- the fine nuances in her voice, her expressive delivery, the clarity of her vocal timbre at every dynamic level. And, that ringing head voice! She embraced this element in her voice like no other in her genre of music. What an absolute gift she was to the music industry. Please add your favorite Whitney Houston moment(s) in the comments section. The MCL community extends our heartfelt prayers and blessings to her daughter and family members. Godspeed Whitney Houston. Your musical legacy will be forever embedded in our minds and hearts. MCL, she had a beautiful voice, that was a gift. Few singers, in my humble opinion,have the kind of natural talent she did. It’s a sad commentary on the life of someone who used her gift to great success and then unfortunately squandered it because of personal demons. Few singers today can match Whitney Houston for absolute innate ability. The only ones that come to mind are Jennifer Hudson,Kelly Clarkson,David Cook,David Archuletta and Michael Buble & Josh Grobin. They are all in a very elite group of naturally gifted singers. The fact there are so few today,is the reality of the music business where good singing is the last consideration,and sales is the first,with the help of technology of course. My fav Whitney moment is the National Anthem performed by her at the Super Bowl the year Desert Storm started. Only one has ever came close to that and that person is David Archuleta, but then David has never performed it with a war in the background and accompanied by a full orchestra. Linda – I loved that performance as well. Somewhere on my blog, I have publicized it but it was a few years ago. Beautiful performance. It’s really sad. There are very few pop singers today who have voices as good or musicality. @Vocab mad “Few singers today can match Whitney Houston for absolute innate ability. ” — I would qualify this as “few pop singers”. I’d imagine many if not most classical singers are naturally gifted. It’s a different genre so it’s a bit like apples and oranges, but I thought your statement was a bit too generic. Regardless, Whitney Houston had a beautiful voice and was a fantastic singer. Kitty – yes we should make this distinction. Singers from all genres excel at their craft. But, among the superstars of pop music, Whitney is part of a small circle of elite singers that includes Celine and Beyonce. Thank you so much for your post about the legendary Whitney Houston. I was a big fan of her’s, and was always captivated by her incredible, incredible voice! I watched most of her 4 hour funeral on Saturday, and found it to be so beautiful, reverent, and non-judgemental. It was one of the most endearing, and heartwarming things I’ve ever seen! Despite the years of abusing herself, she still managed to embrace her failth in Jesus the best she could, and her family and friends kept loving her. She certainly needed that love, because if she didn’t, I believe Whitney would have been gone a long time ago. Something else that was so very heartwrening to me was hearing how badly she damaged her voice because of her lifestyle. Whitney literally destroyed it. I watched 20/20 on Friday, and they mentioned she went back to her vocal coach because she wanted her voice back. It took an enormous amount of work. He worked with Whitney from 2005-2009, and got around 60-80% of her singing voice back, but from what I conclude, she quit seeing her vocal coach after 2009. They showed a video from her 2010 tour when she was singing “I Will Always Love You” and it was sadly horrible. It just made me want to cry. At least now Whitney is at peace! Anita – I have seen some videos of her 2010 tour. Beyond sad. One can never go back again. It’s Cardinal Rule #1. Better to leave at the peak of your career. Have you seen Barbra Streisand’s “Evergreen” performance at the Grammys last year? Same thing. I don’t know why she insists on succumbing herself to this kind of pressure. No I didn’t see Barbra’s performance. With Whitney, she seemed to make strides in working with her voice from 2005-2009, but later I think she just gave up. I don’t believe her voice would ever be the incredible volce it once was, no matter how hard she worked. The severe damage was already done. She surely made it worse for herself by deciding to go on that International tour in 2010. Many people were even walking out while she was still on stage, and asking for their money back. It was such a horrible shame! What boggles my mind is Whitney grew up with this strong faith in Jesus which she carried with her into adulthood. How could a woman with such faith, and wasn’t afraid to proclaim that, fall in such a devastating way? It brings me to tears just thinking about that, Rosanne! Masterclass Lady – Totally agree. I can’t stand Celine Dion or Kelly Clarkson attempting Schubert Ave Maria though (if anybody thinks they are good at it, I suggest listening to Barbara Bonney). They are good pop singers, and they should understand their limitations. Whitney Houston was very intelligent, and sang material she is good at, although I thought that with her incredible voice she could’ve pursued classical career if she had chosen that career path. I know this is a closed topic, but I am curious if there are any beautiful singers that retain 90% of the vocal ability of their youth. I am wondering about Elvis Presley and Rosemary Clooney…maybe Bing Crosby? Although Elvis was only 42. 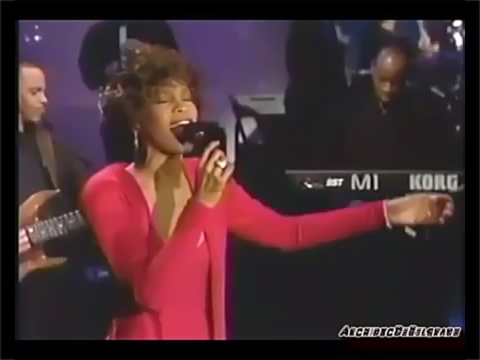 Whitney was so talented…so sad.